Here we are in the Center of [Virtual Second Life ] Town Look! British Council Israel and MetaverSense Ltd have signed a strategic partnership to offer a new learning and teaching virtual experience in the British Council's Second Life Island for Israeli teachers and students. The parties will work together to promote the use of virtual worlds for education by raising the awareness of the British Council’s Second Life islands and MetaverSense's professional educational services. 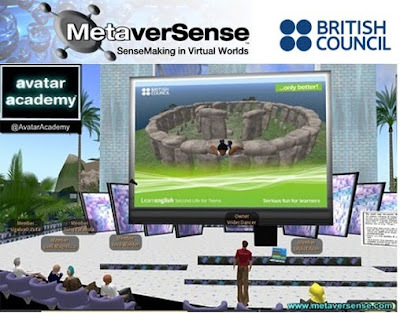 MetaverSense Ltd will promote the British Council Second Life teen and adult islands at lectures, workshops and courses given by MetaverSense Ltd within the Israeli Educational System and British Council will promote MetaverSense's professional services among teachers. MetaverSense Ltd offer Israeli Institutes and teachers professional development, training and consulting services in Second life and other related virtual worlds platforms for engaging instruction and learning. The Two parties will work together to establish a coherent pedagogical and technological framework to support effective educational use for Israeli education High Schools, Middle Schools teachers and teens. MetaverSense Ltd is offering a new virtual @AvatarAcademy course entitled: "When the Internet and the Middle East meets" in which participants will explore and learn the complexity of Middle East themes using an avatar in Second life. Dr. Tal Pavel is an expert in technology and internet usage in the Middle East and the Islamic world. He holds a Ph.D. in Middle Eastern Studies from Bar-Ilan University, Israel. His MA thesis studied the image of Hezbollah, as reflected in its websites. In his doctorate, Pavel evaluated the changes in governmental restrictions on Internet usage during 2002-2005 in four Middle Eastern countries: Egypt, Syria, The UAE, and Saudi Arabia. Dr. Pavel is a research fellow at the Moshe Dayan Center for Middle Eastern and African Studies, the Netvision Institute for Internet Studies, and the International Institute for Counter-Terrorism.